I don’t think that our driver was a rule follower. It was my husband’s first time in New York City. Actually, it was his second, but the first time had occurred almost 20 years ago when he was flown in to detain a drug dealer in Spanish Harlem. He swooped in and swooped out in the dark of night, and to me, that doesn’t count as a ‘visit’ to this amazing city. We arrived at the airport and all was great. Except for the fact that we had packed everything in black, plain, very ordinary suitcases. Hmmm. When the suitcases came in, we looked at each other and I said, “Do you know what yours looks like?” Yikes. Well, amazingly, we found them and opened them up right then and there to be sure that we didn’t have someone else’s stuff. Note to Self: When traveling, always make sure that your check in very ordinary, black suitcase has some familiar detail that will allow you to recognize it. Next step: shuttle bus. We get on the bus with some other very kind, but extremely verbal and talkative Southern folks, with very strong accents. Every word was loud and one syllable words were stretched in to two or three syllable words. I don’t know whether they were nervous about their trip, but the more they talked, the more distracted and agitated our driver seemed to be. Granted, I wouldn’t want to drive 12 very diverse “foreign” travelers in a large van through the streets of NYC. But our one hour drive from JFK to Manhattan was full, that’s for sure. We almost hit a pedestrian. We swerved in and out of traffic missing other vehicles with only centimeters to spare. My husband looked straight ahead and took note of all of his surroundings and seemingly tried to ignore the constant chatter of those around him. The faster the driver, drove, the louder the Southerners talked. I think it was like a vicious cycle. These kind and very verbose southerners were the first to get off of the van (probably by the driver’s design!). Once they were off, the ride seemed a bit more calm, that’s for sure. My husband seemed to relax and so did all the others in the van including me! Funny how the stress of the erratic crazy driving seemed almost trumped by the loud and constant conversation of the other travelers. 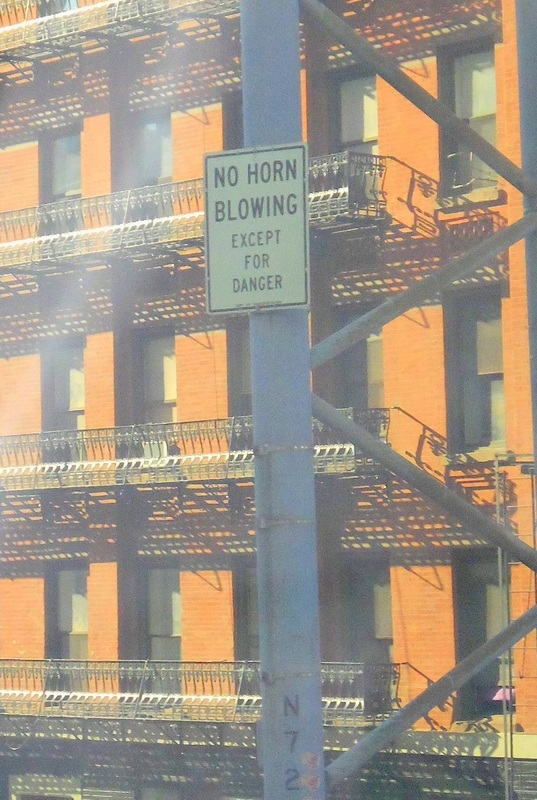 But the sign that says, “No Horn Blowing Except in Case of an Emergency”, well, that was not adhered to by our driver. Or by most of the drivers around. Guess there are some rules that just go unnoticed. Especially in NYC, especially when there is an urgency to get to a location quickly. Especially when incessant chatter drives your driver crazy. Nope, I don’t think that our driver is a rule-follower. Makes for some memorable moments. Glad you survived your trip as well!